The only thing better than a delicious, low-carb breakfast is a week’s worth of delicious, low-carb breakfasts! 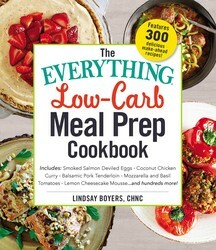 Nutrition consultant Lindsay Boyers, author of THE EVERYTHING LOW-CARB MEAL PREP COOKBOOK, shares a recipe for Cinnamon Swirl Muffins you can enjoy for days. Combine all ingredients except 2 drops stevia, ghee, and cinnamon in a blender and blend until batter is smooth. Spray a 12-cup muffin tin with nonstick baking spray. Fill each well evenly with muffin mixture. In a small saucepan, melt ghee over medium heat. Add 2 drops liquid stevia and cinnamon and stir until combined. Top each muffin with 1⁄2 teaspoon of cinnamon mixture and swirl with a toothpick. Bake 10 minutes or until toothpick inserted in center comes out clean. Transfer two muffins into each of six airtight containers or snack bags and store at room temperature until ready to eat. A Note on Choosing a Protein Powder: A lot of protein powders are loaded with sweeteners and aren’t compatible with a low-carb diet. Others are low in carbohydrates but still contain artificial sweeteners that aren’t good for you. Make sure to check your labels when choosing a vanilla protein powder and choose one that contains only natural, carbohydrate-free sweeteners like stevia. If you’re okay with dairy, Primal Kitchen makes a great protein powder called Primal Fuel. If you’d rather avoid dairy, try the Designs for Health PurePaleo line. For 299 more recipes for healthy, low-carb meals, pick up a copy of THE EVERYTHING LOW-CARB MEAL PREP COOKBOOK.